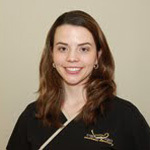 Cara Strickland has been a Registered Dental Hygienist for over 10 years. She graduated with Honors from Fayetteville Technical College and holds a degree in Applied Science. Cara is a member of the American Dental Hygienist Association and the North Carolina Dental Hygienist Association. She attends continuing education classes every year, is X-ray certified, and is trained to treat periodontal disease. Cara has lived in North Carolina since 2000. She and her husband Jack have been married for over 8 years and they have 2 beautiful children, a little girl and new baby boy. When not at work, Cara loves spending time with her family and her 2 Yorkies. She enjoys getting away to the beach and is also involved with her local church. Cara's gentle and sweet personality will make you feel at ease immediately.